Description Encourage your little one with this adorable set of 4 watercolor animals from the Safari Collection, a collection of furry, feathered, and four-legged friends to encourage your little ones. 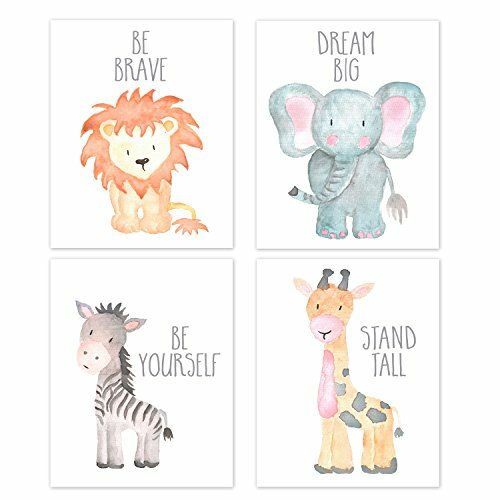 Includes Lion - Be Brave, Giraffe - Stand Tall, Zebra - Be Yourself and Elephant Dream Big! Available with or without words! A perfect easy-to-order set to transform any nursery, children's room or playroom into a wild adventure! If you have any questions about this product by Adoren Studio, contact us by completing and submitting the form below. If you are looking for a specif part number, please include it with your message.